Weather: The weather is very pleasant and moderate between September and March. The temperature roves in between 22 and 30 degree Celsius..
Food: The diversity of cuisine is reflective of the social and economic diversity of Bangalore. Bangalore has a wide and varied mix of restaurant types and cuisines. Roadside vendors, tea stalls, and South Indian, North Indian, Chinese and Western fast food are all very popular in the city. Udupi restaurants are very popular and serve predominantly vegetarian, regional cuisine. Accommodation: Bangalore have good and convenient accommodation options for visitors. You can book the accommodation prior to visit to avoid any problems. There is an array of hotels in Bangalore with a range of price to suit your needs. 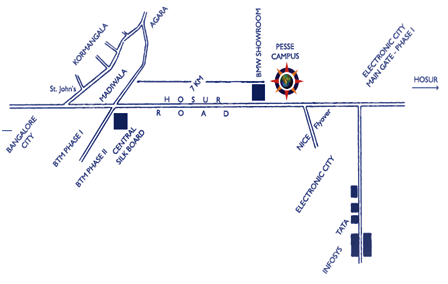 PESIT Bangalore campus is located on Hosur Road, 1 Km before Electronics City. The picturesque campus which also hosts Azim Premji University, is well connected by road, rail and air. By Road: Bangalore is well connected with the major cities in Karnataka, Kerala, Goa, Mumbai, Chennai, Hyderabad and other cities. Buses run between these cities and Bangalore frequently. The Central Bus terminus is at Majestic. Peripheral Bus terminus are across the city. Prepaid taxis and auto-rickshaws are available from these bus terminus. PESIT South campus is located about 20 Kms from the city railway station in Majestic. Several buses ply to Electronic city from Majestic Bus Terminus. Other than City railway station, Bangalore also has Yeswanthpur Railway Station. Prepaid taxis and auto-rickshaws are available from these stations.